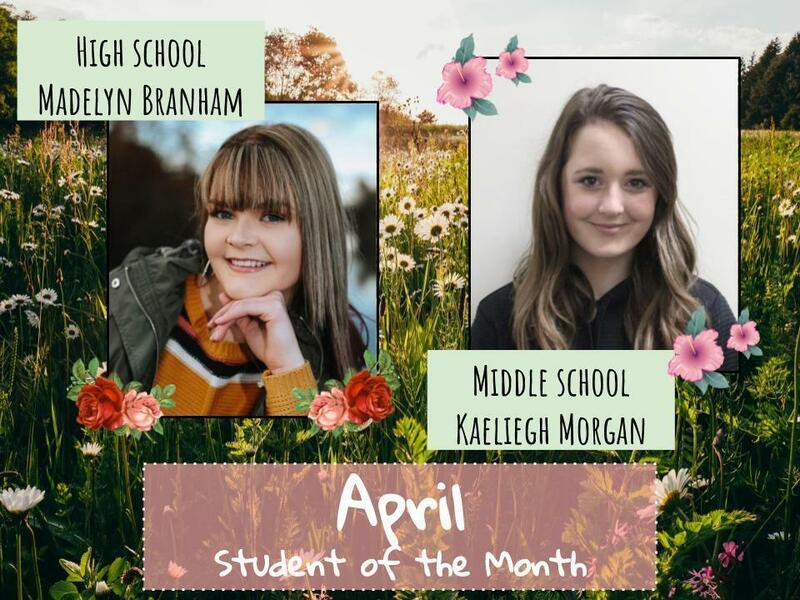 We are pleased to announce our April students of the month. For middle school, Kaeliegh Morgan and high school, Madelyn Branham. Congratulations and great work! Kaeliegh Morgan is in the 8th grade. She is the daughter of Bobby and Terah Cole. She is actively involved in MS STUCO, academic team, and runs track. Some of her favorites include the color coral, Chinese/Mexican food, speech class, and Mrs. Dillon. Madelyn Branham is in the 12th grade. She is the daughter of Rebecca and William Branham. She is actively involved in slow-pitch softball, basketball stats keeper, and is the Vice-President of her senior class. Madelyn's favorites include chicken enchiladas, the color yellow, and computer science II class. She most enjoys Mrs. Morisset and Mrs. Young in the classroom.